The impressive City Hall. Right: Morning light bathes the cathedral. 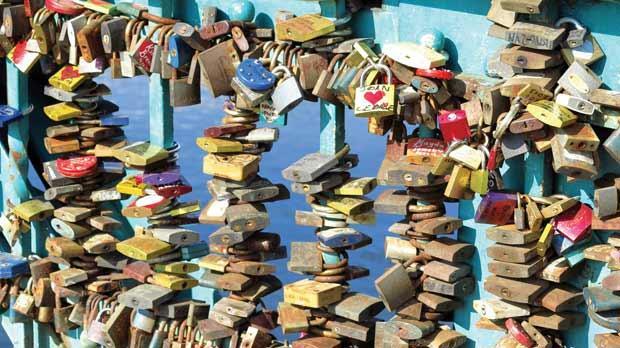 Lovers' padlocks on the bridge of hope and dreams. Boozy dwarfs up to no good. A biker dwarf pushes the boundaries. 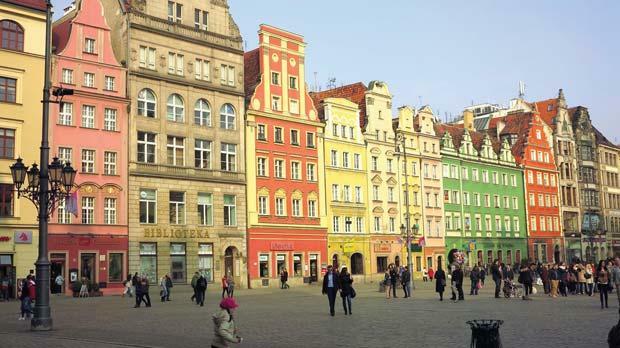 Colourful houses on Wroclaw's main square. While marvelling at Poland’s most charming city, Stephen Bailey is in a race against time to find 50 dwarfs or he’ll face a forfeit: copious amounts of vodka. Dwarfs have always had a reputation as cheeky souls, but the one in front of me is really pushing boundaries. He’s hanging out on the steps of the cathedral sporting a huge beard and sunglasses. Oh, and he’s straddling a Harley Davidson. It’s the eighth dwarf I’ve seen today. I tripped over a prostrate one outside Pizza Hut, saw two fire-fighting dwarfs besides the belfry entrance, and found a tourist dwarf with a camera around his neck and guidebook in his hand. Eight down... that means 42 more dwarfs to go. 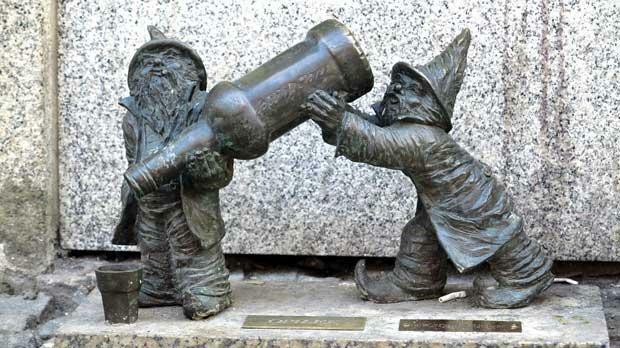 Apparently, 20 years ago there were only 15 dwarfs in Wroclaw. That number has swelled to over 200, although nobody is exactly sure how many there are. They’ve become lucky mascots and many businesses pay to install one outside their door. Being dwarfs they’re hard to spot. Every time I forget about my dwarf-hunting mission I walk past a couple without realising. You have to always look down, particularly as they’re only about 30cm high. A Polish friend challenged me to spot and photograph 50 of the little sculptures. The prize is leaving Wroclaw in one piece, as the forfeit involve the city’s other obsession: vodka. I’ve gone back to the centre of the old city, certain that I’ve missed a few. Narrow buildings on the city square come in a variety of pastel shades, uniformity provided by cute tiled roofs. Bearded buskers play with surprising elegance, while couples sit in the fading afternoon sun. There’s two more dwarfs, passing coal between each other beneath a cafe window. And another one, swigging from a bottle outside a wine shop. 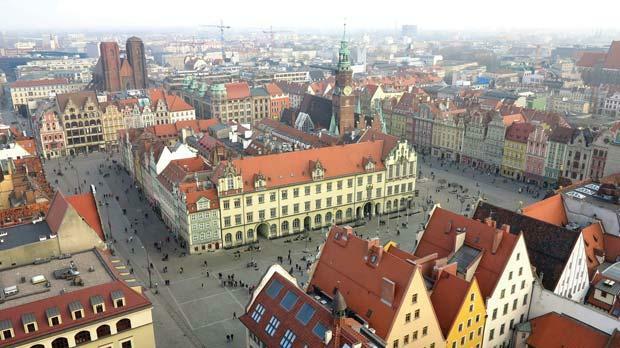 Wroclaw has more than dwarfs, a lot more, considering that it’s due to be European Capital of Culture in 2016. Other places in Poland can seem dreary, the cold and coal pollution casting a gloomy shadow. But this town has a joyous atmosphere, the streets full of smiles and laughter. Tell a Pole that you’re visiting Wroclaw and their eyes go all hazy, as if it’s some kind of promised land. It’s a city that can boast 1,000 years of history and an impressive catalogue of cultural icons: artists, writers, poets, and now sculptors. I walk along the university square, and a triple offering playing hide-and-seek beside a tram stop bring my total to 21. I saw another one beneath the grand façade of the 17th-century university building, a distinct baroque style screaming from the huge window frames. Statues outside detail sword fighting heroes and thoughtful academics. A nearby church takes on the architectural baton, intricate murals covering every inch of the walls and domed ceilings. There are many other churches nearby, enchanting leftovers from the 16th century or crumbling brick churches that are over 800 years old. Somehow Wroclaw survived World War II in one piece. The town celebrates its role in reconciliation, with a proud statue of the bishop who wrote a letter to the Germans in 1956 saying “we forgive you”. The cathedral is the most impressive, rising 60 metres and standing on its own island. It’s Sunday, and soft chants from the choir sail along the breeze. I’ve done it again. Gazing at the towering church spires I’d almost missed two more dwarfs. One is playing the accordion. The other twiddles a long beard and carries a love heart. 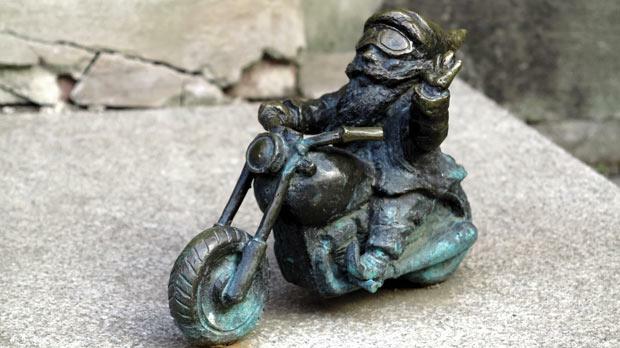 Each dwarf is made from dull monotone metal, almost blending into the concrete when the street lies in shadow. But the attention to detail is stunning. Eyes reveal emotion, and each dwarf shows they are happy to play along with the town’s cheery humour. Accessories reflect the business they stand beside, like the reading glasses and open page of a dwarf outside a book shop. Am I on 25 or 26? I can’t remember if I’ve counted the one who’s fishing on the bridge. It’s a bridge of hope and dreams. Thousands of padlocks are secured to it, each inscribed with the names of loved ones. Two stalls sell padlocks. It’s like a €2 couples’ tax as no hand in hand pair want to cross without adding their own lock of love. There is barely any space left, and one couple argues over where to put their lock. Melt down the keys that lie beneath the bridge and you could probably sculpt a pair of kissing dwarfs. Crossing another bridge and I’m in modern Wroclaw. Glass-fronted shopping centres and abrupt neon lights show a less than appealing side to the city. It’s better staying within the confines of the river that surrounds the old town, where it’s almost a fairytale world. Occasionally the onslaught of American-isation diverts the eye, like a big M or a Starbucks clambering for attention. But like the dwarfs, they can easily be missed. 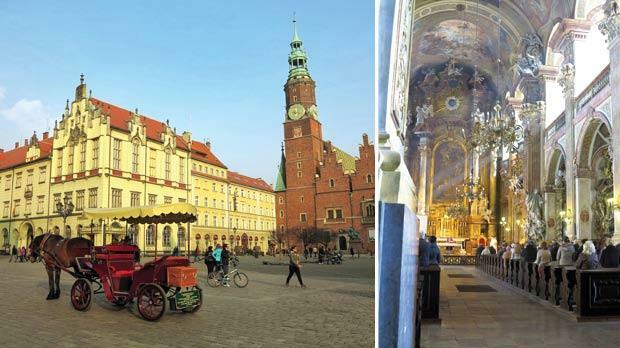 While Wroclaw doesn’t have a long tick list of sights, wandering the old town is an attraction seemingly without time restriction, especially when you’re hunting for dwarfs. One playing with an abacus, another with a walking stick, but two days have gone by and I’m short of my target. I’ve spotted 42, and that’s only after giving a street violin player €5 in exchange for information on dwarf locations hidden down back streets. I must take the punishment. The bar walls are covered in newspapers from 1989 and for less than €1 they serve vodka in glasses as big as my hand. Eight dwarfs short, which means eight vodkas, and by the end of it I’m successfully reading about the fall of the Berlin Wall, in Polish. Then out on the streets I further appreciate Wroclaw’s charms. Vodka makes it more of a fairytale, as if a beautiful princess will dangle her hair from the opulent windows of the City Hall. Soft lights illuminate the streets, giving them a seductive atmosphere.